Bahri Najafi, R., Rezaei, Z., Najm, O. (2011). Formulation and Evaluation of Phenytoin Sodium Buccoadhesive Polymeric Film for Oral Wounds. Iranian Journal of Pharmaceutical Sciences, 7(2), 69-77. Rahim Bahri Najafi; Zahra Rezaei; Omar Najm. "Formulation and Evaluation of Phenytoin Sodium Buccoadhesive Polymeric Film for Oral Wounds". 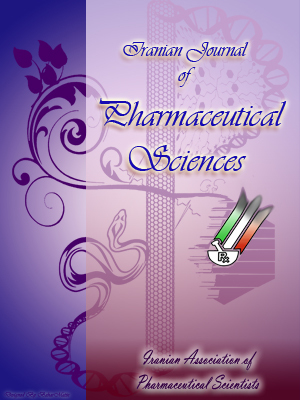 Iranian Journal of Pharmaceutical Sciences, 7, 2, 2011, 69-77. Bahri Najafi, R., Rezaei, Z., Najm, O. (2011). 'Formulation and Evaluation of Phenytoin Sodium Buccoadhesive Polymeric Film for Oral Wounds', Iranian Journal of Pharmaceutical Sciences, 7(2), pp. 69-77. Bahri Najafi, R., Rezaei, Z., Najm, O. Formulation and Evaluation of Phenytoin Sodium Buccoadhesive Polymeric Film for Oral Wounds. Iranian Journal of Pharmaceutical Sciences, 2011; 7(2): 69-77. In recent decades, most of researchers in pharmaceutical preparations have focused increasingly on new formulations that control the site and amount of drug delivery. Mucoadhesive dosage forms are available for systemic or local treatment. The mucoadhesive dosage forms are introduced in various forms such as tablets, gels, ointments, patches and polymeric films. For buccal wound and injury the polymeric films may be preferred due to flexibility, comfort, longer residence time, protection of the wound surface and promotion of the wound healing. Most of dentists apply phenytoin sodium suspension as a gargle for promoting healing in dental surgery. In this study, a novel phenytoin sodium mucoadhesive film consisting of two layers of polymeric film was prepared by solvent casting method. One layer contained various ratios of carbapol 934, NaCMC, HPMC and a constant proportion of PEG 400 as plasticizer. The other layer contained cellulose acetate phethalate which acts as water resistant for unidirectional release. The film's mechanical properties such as swelling, in vitro adhesion/drug release and residence time by using human volunteers were measured. among different polymers the HPMC/Na CMC/CP 934 were selected and thirteen formulations (F1-F13) were prepared. The best formulation in physical properties were F1, F6, F8, F9 and F13. F8 had the highest and F1 had the lowest swelling index, and all formulations had high adhesive strength. Formulation F6 had a fast release pattern during the first 30 mins, but F8 had the highest amount of release in 3 hours. F1 had the lowest amount of release during 3 hours. F1 had the longest residence time while F8 and F9 showed the shortest residence time accompanied with detachment. From the current study, one can conclude that the buccoudhesive film of F13 containing 60% HPMC, 20% NaCMC and 20% CP had zero order models of drug release and possesses suitable swelling profile, good adhesion strength, appropriate residence time and produced no irritation. Optimum ratio for the mucoadhesive polymeric film composed of Carbopol/Na CMC/HPMC, was 20/30/40 (wt/wt/wt) in terms of flexibility, comfort, long residence time, swelling, and bioadhesive force. Phenytoin has been used in the healing of pressure sores, venous stasis, diabetic ulcers, traumatic wounds, and burns [1, 2]. The mechanism by which phenytoin accelerates wound healing is unknown but in vitro studies suggest that phenytoin may be involved in the healing process at several levels including stimulating fibroblast proliferation, enhancing the formation of granulation tissue, decreasing collagenase activity, promoting deposition of collagen and other connective tissue components, decreasing bacterial contamination, and decreasing wound exudates . In recent decades, most of researchers in pharmaceutical preparations have focused increasingly on new formulations that control the site and amount of drug delivery. One of these formulations is mucoadhesive dosage forms that are available for systemic or local treatment. The mucoadhesive dosage forms are introduced in various forms such as tablets, gels, ointments, patches and polymeric films. For oral wound, sustain release polymeric films may be preferred due to flexibility, comfort, long residence time, and protection of the wound surface, thus, reduces pain and also could treat oral diseases more effectively . A mucoadhesive sustain release drug film can be easily applied and localized to the application site, and can be removed from there if necessary . During the last decade, bioadhesive polymers received considerable attention as platforms for buccal controlled delivery due to their ability to localize the dosage form in specific regions to enhance drug bioavailability. The polymers used for the mucoadhesive film include polymers which are hydrophilic and/or water-dispersible. Preferred polymers are water-soluble cellulose derivatives such as hydroxy propyl methyl cellulose, hydroxy ethyl cellulose or hydroxy propyl cellulose, either alone, or in mixture forms. Other optional polymers include polyvinyl pyrrolidone, carboxy methyl cellulose, polyvinyl alcohol, sodium alginate, polyethylene glycol, natural gums like xanthene’s gum, tragacantha, guar gum, acacia gum, water- dispersible polyacrylates like polyacrylic acid, methyl methacrylate copolymer, and carboxyvinyl copolymers. The concentration of the water-soluble polymer in the final film can vary between 20 and 75% (w/w), preferably between 50 and 75% (w/w) . The amount of drug to be incorporated into the film depends on the kind of drug and is usually between 0.01 and 20% (w/w), but it can be higher if necessary to achieve the desired effect [6-8]. The aim of this study was the preparation of a novel mucoadhesive bilayer film from sodium phenytoin by solvent casting method that one layer contain various ratios of carbapol 934, NaCMC, HPMC and a constant proportion of PEG 400 as plasticizer, and the other layer contains cellulose acetate phthalate which acts as water resistant for unidirectional release. The film's mechanical properties such as swelling, in vitro adhesion/drug release and residence time by using human volunteers were measurement. There are several technologies for preparation of thin film strips such as: solvent-casting method, and hot-melt extrusion and spraying technique [9, 10]. Among these techniques in laboratory, the costing method is practical. In solvent- casting method the water-soluble polymer and plasticizer are dissolved in hot water by stirrer to form a clear viscous solution. The active ingredient and other agents are dissolved in small amount of water. This mixture is then added to the aqueous viscous solution and stirred to produce a hydrocolloid solution. This solution is then dispersed in Petri dishes and put on room temperature to dry. Carbopol 934 (CP) was obtained from BF Goodrich (Cleveland, OH, U.S.A.). Hydroxypropyl methylcellulose (HPMC), Na CMC, sodium phenytoin and PEG 400 was purchased from Daropakhah Pharm. Ind. Co. (Iran). All other chemicals were of extra pure reagent grade and were used as received. Table 1. The composition of various film formulations in 100ml distilled water. After conducting preliminary tests, which focused on adhesive force, dissolution, release, and flexibility, thirteen formulations with specific quantity of polymers HPMC/ Na CMC /CP 934 was chosen. Various ratios of CP 934, and HPMC, Na CMC, were weighted to make a polymeric solution of 1% W/V in 100 ml distilled water as shown in Table 1. For each formulation, a constant amount of sodium phenytoin and PEG 400 (plasticizer) was added under continuous mixing at 1000 rpm. The solution was stirred for an hour and was kept overnight to remove all entrapped air bubbles. For further uniformity the polymeric solution was extruded through a three roller mill. The polymeric solution was poured into two Petri dishes each with 11 cm diameter and put on room temperature to dry. A water resistant polymeric layer was prepared from cellulose acetate phthalate by dissolving cellulose acetate phthalate (10% W/V), propylene glycol (3%W/V), and methylene chloride (48% W/V) in alcohol. One ml of this solution was poured in each Petri dish and was spread evenly on the surface. After drying, the films were carefully removed from the Petri dishes and checked for any imperfectness and were cut into pieces of 5 cm2 with 100-120 micron thickness, each containing almost 9 mg of the drug . The thickness of each piece of film was measured using a micrometer at five location variation of greater than 5% were excluded from analysis. Appropriate swelling behavior of a buccal adhesive system is the essential property for uniform and prolonged release of the drug and effective mucoadhesion . The film swelling study was conducted using simulated saliva solution which consists of phosphate buffer saline solution (2.38 g Na2HPO4, 0.19 KH2Po4 and 8.00 g NaCl per liter of distilled water adjusted with phosphoric acid to pH 6.75). To accomplish the film samples without water resistant layer (surface area: 1 cm2) were weighted and placed in a pre-weighed stainless steel basket with sieve opening of approximately 700 m. Then the basket containing the film sample was submerged into in a beaker (diameter 5.00 cm) contained 15 ml saliva simulated solution. Increasing the weight of the films was determined after 4, 8, 12, 16, 20, 24 and 28 min intervals. The degree of swelling was calculated using parameters (wt-wo)/wo, where wt is the weight of film at time t, and wo is the weight of film at time zero . This measurement was repeated five times for each formulation and the mean result was calculated. Table 2. In vitro adhesiveness of various sodium phenytoin films. The methods for determining mucoadhesion can be classified into two major categories: in vitro/ ex vivo methods and in vivo methods. The most common methods are based on the measurement of either tensile or shear stress . In this study, an instrument was designed to evaluate the tensile force which had some resemblance to the instrument used before . The small part can freely move upwards by sensitive digital balance which is mounted on screw-elevator surface. A drop of water was placed on big part and then a piece of film without water resistant layer (surface area 1 cm2) was placed on it. Another drop of water was then placed above the film and two plastic parts were attached together for one min. After one min, the small part was slightly moved up with the help of screw-elevator surface till detached from the film. The maximum tensile force needed to detach the two plastic pieces was recorded in g/cm2. This test for each formulation was repeated five times and the mean values were calculated. Ten healthy male volunteers, aged between 20 to 26 years were participated in this study after signing informed consents. Prior to the test, the volunteers were trained. They rinsed their mouth with distilled water before insertion of a piece of the film (surface area; 1 cm2) and then the film was placed on their palate instead of buccal mucosa for better compliance. The volunteers were restrained from food, drinks and talking during the evaluation period. The volunteers were asked to record the time necessary for complete erosion of the film. Each formulation was tested three times in three different days for residence time and results were recorded and the mean times were used for final evaluation. Simultaneously, volunteers were asked to record their observation about film detachment and for any irritation [11, 12]. Dissolution data were analyzed using the Ritger and Peppas equation to describe the mechanism of drug release from matrices [(Mt/M∞)= Ktn]. Where Mt corresponds to the amount of drug released in time t, M∞ is the total amount of drug that must be released at infinite time, K is a constant and “n” is the release exponent indicating the type of drug release mechanism . If n approaches to 1, the release mechanism could be zero order and if n approaches to 0.5, the release mechanism can be Fickean. On the other hand if 0.5 < n< 1, non- Fickean transport could be obtained. The cumulative percent of released drug versus time was assessed for zero order release kinetic. The logarithm of the amounts of the remaining drug to be released was assessed for first order kinetic and the data of cumulative percentage drug release versus square root of time data were used to evaluate the Higuchi model kinetic. As mentioned in the material and method variety of polymers were investigated for their ability to form mucoadhesive film. From different polymer the HPMC/Na CMC/CP 934 were selected and thirteen formulations were prepared. Table 1 shows the formulations prepared with different ratio of HPMC/Na CMC/CP 934 in 100 ml of each film formulation. The best formulations in physical properties were F1, F6, F8, F9 and F13. The results of swelling study are depicted in Figure 1. F8 had the highest and F1 had the lowest swelling index. Results derived from in vitro adhesive study (Table 2) shows that all formulations have high adhesive strength. The patterns of drug release from various formulations are shown in Figures 2 and 3. Formulation F6 had a fast release pattern during first 30 min, but F8 and F9 had the highest amount of release in 3 hours (Figures 2 and 3). F1 had the lowest amount of release during 3 hours (Figure 2) . Results derived from using various kinetic models in release of sodium phenytion from formulations are in Table 3. Release data were analyzed using zero order, first order and higuchi model up to 60% of total release. The residence time in volunteers for each formulation was tested three times and the results are shown as average values in Table 4. F1 had the longest residence time while F8 and F9 showed the shortest residence time accompanied with detachment. Figure 1. Swelling of various formulations of sodium phenytoin films. Table 4. Residence time of film placed on the palate human volunteers. Polymers HPMC, NaCMC and CP are used widely in oral bioadhesive dosage forms in various studies. The formulations prepared with blend of HPMC & CP had maximum adhesion strength that in the past study was confirmed . Peh and Wong  described HPMC film as a promising drug vehicle for buccal delivery. Swelling property is an important factor to protect the wound surface, as HPMC has moderate swelling properties, so we add NaCMC to the combination because NaCMC has high swelling properties and surface pH 6.5-7, and no irritation is expected when applied to the buccal mucosa. We first prepared three formulations, each of these formulations contained 80% HPMC, NaCMC and CP polymers, respectively. We found that F1 containing 80% HPMC, is a homogenous film and could easily be detached. F2 consisted of 80% NaCMC, and was brittle so could not be detached due to its brittleness. F3 containing 80% CP, was elastic and could not be detached. Then, we prepared F4, F5, F6 and F7 to asses the property of CP having elasticity and NaCMC having brittleness effect, and we found that F5 and F7 both containing 50% NaCMC were brittle, and F4 despite containing 30% NaCMC and 40% CP, was still brittle. This showed that the brittleness property of NaCMC is dominant over the elastic property of CP.vComparing F4 and F6, both containing 30% NaCMC, F6 was acceptable formula as it could be smoothly detached, but F4 was brittle. This may be related to the higher percentage of HPMC in F6. After that we prepared F8 and F9, which were smoothly detachable. F10 and F12 which were smoothly detachable but still not acceptable due to their heterogeneity. F11 contains 60% CP and 10% NaCMC which was elastic and could not be detached. F13contained 20% CP, 20% NaCMC and 60% HPMC, made a homogenous film and was smoothly detachable. Each one of the physically acceptable formulations (F1, F6, F8, F9 and F13) contained more than 40% HPMC. So far, we can say that CP provides elasticity and NaCMC gives brittleness to the formulations, and HPMC provides a homogenous and smoothly detachable formulation, when its percentage is above 40%. Similar results were obtained by Peh and Wong 1999  in investigating the suitability of a NaCMC/PEG400/CP934 and an HPMC/PEG400/CP934 films as drug vehicle for buccal delivery, and concluded that CP was found to increase the softness, elasticity and bioadhesive strength of the NaCMC and HPMC films. As shown in Figure 4, comparing F1 and F13 shows that, by reducing the HPMC percentage in F13 and increasing the percentage of other two polymers as compared to F1, the swelling index was increased and this is due to the high swellability of CP and NaCMC as compared to HPMC. Comparing F8 and F9 shows that F8 has more swelling index, despite containing 50% aggregate of high swellable polymers (CP and NaCMC) as compared to F9 which has less swelling index despite having 60% aggregate of these two polymers. This explains that by reducing the HPMC percentage in F¬9 makes the network smaller and less able to contain the swelled polymers and the film starts significant erosion, but in F8 the HPMC network is larger (percentage of HPMC increased) and provides more space for swelled polymers to contain in, however, here too we encountered significant erosion. So, it could be concluded that the percentage of HPMC in F8 and F9 is not suitable and in order to obtain an acceptable formulation, the percentage of HPMC has to be more than 50%. F6 shows a significant high swelling index of about 23 min, which could be due to 10% of NaCMC, which also caused a delay in start of swelling as compared to other formulations. As shown in Table 2, the adhesive strength of all formulations is adequate. But the adhesion strength of F8 was more than others, and this is due to-firstly 40% CP which leads to high adhesive strength and secondly due to high swelling index leading to exposure of more sites for adhesion. Similar results were observed by Mohammadi-Samani et al. that by increasing CP934/HPMC ratio, more adhesion strength could be seen. Figure 2. Patterns of drug release from formulations F1, F6 and F8. With the increase in the percentage of HPMC in the formulations a reduction in the amount of drug release was observed in the following order: F9>F8>F6>F13>F1 (data not shown). This could be related to the hydro-solubility of HPMC, despite its moderate swelling properties, promoted the liquid entry and entrapment in the polymer network and thus delayed the drug release . Comparing F8 and F6, both containing 50% HPMC showed that the rate of drug release from F8 is higher than F6 which could be related to the change in the ratio of other two polymers. And from this, we could conclude that for slower release rate and to obtain a suitable formulation the ratio of HPMC to CP has to be more than 2/1. Comparing the pattern of drug release for F8 and F9 showed that the pattern of drug release of F9 was a sudden drug release of about 50% which could be due to the high swellability of NaCMC and CP causing over-hydration and bursting of HPMC network. So, in order to obtain an acceptable formulation the percentage of HPMC is suggested to be more than the additive percentage of CP and NaCMC, or in other words, the HPMC percentage is suggested to be 50% or more. Comparing the pattern of drug release for F6 and F13 showed some resemblance, but F13 was more regular than F6. F1 showed that the rate of drug release was least due to the high percentage of HPMC, causing drug entrapment in the HPMC network. F1 has much longer residence time followed by F13, F6, F8 and F9 (data not shown), and this sequence is opposite to that of rate of drug release in these formulations. These formulations last until they have been completely eroded, and this creates a relationship between residence time and the rate of drug release, so the formulations having longer residence time have slower rate of drug release, such as F1. But the formulations F8 and F9 get detached at 17 min, before they get completely eroded. This could be due to over-hydration and formation of slippery mucilage which is readily removed, this detachment can be speculated from their pattern of swelling as showed fluctuation around 17th min, a sudden drug release around 40 min (data not shown). In human trials, none of these formulations produced any irritation. From the present study, one can conclude that the buccoudhesive film of F13 containing 60% HPMC, 20% NaCMC and 20% CP had zero order models of drug release and possesses suitable swelling profile, good adhesion strength, appropriate residence time and produced no irritation. Figure 3. Patterns of drug release from formulations F9 and F13. A novel mucoadhesive polymer blend film consisting of phenytoin sodium and various ratios of carbapol 934, NaCMC, HPMC and constant proportion of PEG 400 as plasticizer and a layer of water resistant for unidirectional release was prepared by solvent casting method, and was characterized to localize the phenytoin in wound to accelerates wound healing. To explore their in vivo applications, Carbopol, and HPMC were selected based on their mucoadhesion, flexibility, and mechanical strength, respectively. Optimum ratio for the mucoadhesive polymeric film composed of Carbopol/Na CMC/HPMC was 20/30/40 (wt/wt/wt) in terms of flexibility, comfort, long residence time, swelling, and bioadhesive force. This newly developed mucoadhesive film may be preferred over the presently used phenytoin suspension due to its adhesiveness and residence time and effect. Anstead GM, Hart LM, Sunahara JF, Liter ME. Phenytoin in wound healing. Annals Pharmacother 1996; 30: 768-75. Shaw J, Hughes CM, Lagan KL, Bell PM. The clinical effect of topical phenytoin on wound healing: a systematic review. Br Dermatol 2007; 157: 997-1004. Bhatia A, Prakash S. Topical phenytoin for wound healing. Dermatol Online J 2004; 10: 5. Kim T H, Ahn JS, Choi1 H K, Choi YJ, Cho CS. A novel mucoadhesive polymer film composed of carbopol, poloxamer and hydroxypropylmethyl-cellulose. Arch Pharm Res 2007; 30: 381-6. Patel VM, Prajapati BG, Patel MM. Design and characterization of chitosan-containing mucoadhesive buccal patches of propranolol hydrochloride. Acta Pharm 2007; 57 : 61-72. Horst GZ, Jian-Hwa G, Serino A. Water soluble film for oral administration with instant wettability. US Patent 6592887 2002. Peh KK, Wong CF. Polymeric films as vehicle for buccal delivery: swelling, mechanical, and bioadhesive properties. J Pharm Pharm Sci 1999; 2: 53-61. Eouani C, Piccerelle PH, Prinderre P, Bourret E., Joachim J. In-vitro comparative study of buccal mucoadhesive performance of different polymeric films. Eur J Pharm Biopharm 2001; 52: 45-55. Patel AR, Prajapati DS, Raval JA. Fast dissolving films (FDFs) as a newer venture in fast dissolving dosage forms. Internat J Drug Development Res 2010; 2: 232-46. Mohammadi-Samani S, Bahri-Najafi R, Yousefi G. Formulation and in vitro evaluation of prednisolone buccoadhesive tablets. Il Farmco 2005; 60: 339-44. Nafee N, Ismail F, Boraie N. Mucoadhesive delivery systems; evaluation of mucoadhesive polymers for buccal tablet formulation. Drug Development Industrial Pharm 2004; 30: 985-93.